So, before I get into the specific of this post, I feel I should make it clear that coconut cakes and I don’t really have much of a history of “getting along with each other”. I always tell people that ask me that I learned how to be a pretty decent baker through lots of trial and error. Best way to learn. As it turns out, several of those “errors” have come through my attempts at making coconut cakes over the past few years. Sometimes it’s worked wonderfully. Sometimes I’ve just blown it. Maybe it has something to do with the fact that I’ve never really been that much of a coconut fan in general; I don’t like Pina Coladas (or getting caught in the rain by the way). I think Mounds Bars are disgusting. Shredded coconut on its own reminds me of tasteless confetti or wood shavings. I do like to cook with raw, unsweetened coconut milk very much but on it’s own? Meh. However…my grandmother’s favorite kind of cake is coconut cake. Therefore for the past four or five years, every June when her birthday comes around, I set out to bake her a coconut cake. I’ve baked about 5 different coconut cakes over the past few years; they’ve ranged from ridiculously basic to EXTREMELY complicated. Some have taken little to no effort and others have took me all day long. The first one I attempted was when I had first started my foray into baking. I wanted to make my grandma a cake for her birthday and my mom (in her infinte wisdom) advised me that I should start with something basic and easy to do. I found a recipe an old cookbook of hers that she suggested I try. I had my doubts about it: first, it was supposed to be made in a 13 x 9 pan. Me, being the naive over-eager overachiever I was, thought that was “too easy”. Second I was worried that because the recipe was in a fat free cookbook, it wouldn’t be very tasty. Turns out, it was DELICIOUS. Seriously. I didn’t and still do not even like coconut cake…and I still ate a big slice of that one. I’ve made subsequent coconut layer cakes for my grandma after that one that turned out well. Some VERY well. However, it was always that first fat free, easy-peasy coconut cake that I made for her as a novice baker that remained the crowd favorite. This year, I attempted to make one that I bookmarked from Food and Wine magazine. I’ll make a long story short by just letting you guys know right off the bat: it didn’t work. In retrospect I don’t think that I beat the ten eggs that were in the batter nearly long enough to make it rise high and fluffy. The cake came out SUPER dense and flat. I knew right away I had messed up and would have to make a hasty adjustment/save if I was gonna have a cake ready for my grandma’s birthday. Once again, my mom suggested I just go back to the “Old Faithful” cake I made for her the first time. I started to brush it off…the I stopped to think a little bit. Once I finished thinking and mulling it over for the night, the next morning I decided to go ahead and bake the first cake again; but this time, I thought of several ways to “doll it up”. The first way was based off the shape of a cake I saw on Pinterest. I did some Googling and baking science research and it turns out, that the same amount of batter that goes into a standard 9 inch two layer cake also goes into a 13 x 9 size cake. That amount of batter can also fit inside a 15 x 10 x 1 baking sheet without spilling over. The original recipe for the coconut cake was for a 13 x 9 cake pan. It took me about .2 seconds to see how I could make this work rather nicely. Basically, what I did was bake the coconut cake in a sheet pan, cut the cooled & finished cake into 3 equal vertical pieces, and stack them on top of each other to form a square layer cake. For the frosting, I decided to adapt from the vanilla buttercream I made for my Funfetti Layer Cake; I swapped out vanilla extract for coconut extract, and plain milk for coconut water. Finally, I pressed coconut flakes I briefly toasted in a skillet to the sides and tops of the cake. By the time I finished, I took a step back and felt pretty darn proud of myself. Let me just state again for the record: I do not like coconut. I do not care very much for coconut cake. But…. this cake. THIS CAKE. I think what may blow my mind the most about this recipe is the cake itself; it’s a low fat cake, but holy cow is it MOIST and FLUFFY and yes, still plenty sweet. It’s perfectly complimented by the coconut buttercream–which I feel I ought to point out, is NOT low fat whatsoever. I mean after all, this is a birthday cake. Birthday cakes should never be completely low in fat. The sweetness of the buttercream is perfectly tempered by the subtle nutty flavor of the toasted coconut. It went over like gangbusters with my grandparents and I gotta say, I was not surprised. This was just a great idea all around. I also think I may have found a new, preferred way of making layer cakes in general. Whoop Whoop. Happy Fiesta Friday #124 and thanks to our co-hosts this week, Lindy @ Love in the Kitchen and Liz @ spades, spatulas & spoons. Preheat oven to 325°. Grease, flour and line a large rimmed 15 x 10 x 1 baking sheet with parchment paper. Set aside. Place the coconut water and shredded coconut in a bowl and stir together. Combine the flour, sugar, baking powder and baking soda and stir to mix well. Add the coconut mixture, egg whites, vanilla extract and coconut extract and stir to mix well. Spread the batter evenly in the baking sheet. Tap the baking sheet on a counter top a few times to release air bubbles. Bake for about 25-30 minutes, until a toothpick inserted in center comes out clean. Let cool in pan for about 10-15 minutes before flipping out onto a wire rack to cool completely. Beat butter and salt at medium speed with an electric mixer 1 to 2 minutes or until creamy; gradually add powdered sugar alternately with 6 tbsp. coconut water, beating at low speed until blended and smooth after each addition. Stir in coconut extract. If desired, beat in remaining 1 tbsp. coconut water, 1 tsp. at a time until frosting reaches desired consistency. Place the completely cooled cake on a cutting board and cut into equal thirds. (About 4 1/2 inches) Make sure both cakes are evenly leveled before beginning to decorate. Line the edges of a cake platter with strips of parchment paper to keep the platter clean while you assemble the cake. Place one (evenly leveled) cake layer on the platter. Spread 1 1/2 cups of the frosting evenly across the top of the cake with a spatula. Place the second cake layer on top, then spread with just enough over the top and sides to make a crumb coat. (It should be thin). Refrigerate cake for one hour until the crumb coat is firm. Finish spreading the remainder of the frosting on the cake. Gently press toasted coconut flakes onto sides and tops of cake. 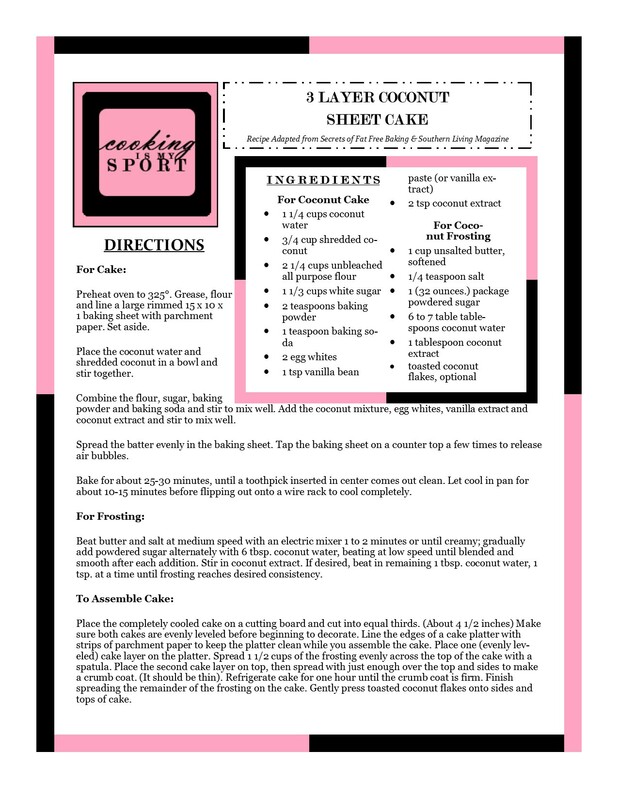 I have been craving a coconut cake lately, love the 3 layers here and you have layered coconut into this recipe beautifully. It’s a gorgeous cake Jess. This looks delicious! I love coconut cake, but the problem is I feel like most people I know don’t, so it’s hard to find an excuse to make it without me eating it all! Well as someone who ‘doesn’t’ like it, I still VERY much enjoyed this cake, so maybe you can make temporary believers out of them lol Thank you! What a perfect cake, Jess! Love it! Oh gosh – this is a BEAUTY! Thanks so much for bringing it to Fiesta Friday!! This is one beautiful cake, Jess! I wouldn’t ever know that you had any problem baking coconut cakes. John doesn’t like coconut and I can give or take it so I don’t use it much. I hate artificial coconut and pina colada’s! I’ll be honest I didn’t read a word of this post, I was so absorbed in these PICTURES girl, wooooo! Oh WOW! This looks AMAZING!!! !